One of the things I love the most about Disney World is the way everyone feels so free to talk to everyone else. For example, in the lines for one of the rides my children and I met another homeschooling family. We had talked enough by the time we reached the ride itself that my 10-year-old daughter rode it with the other family’s mother sitting next to her. And I didn’t think a thing about it. Where else in the world would I do that? Yes, the things that link people together are common enough that the world can be called small, but there are so many of us, going through so many things both good and bad, that the human experience becomes a vast universe. The world is filled with different languages, different scenery, and different personalities. It can be overwhelming, but it can also be a beautiful tapestry, if we just realize the wonder of it all. Depression can make a person’s world so small. I’m tired of small. I want big. 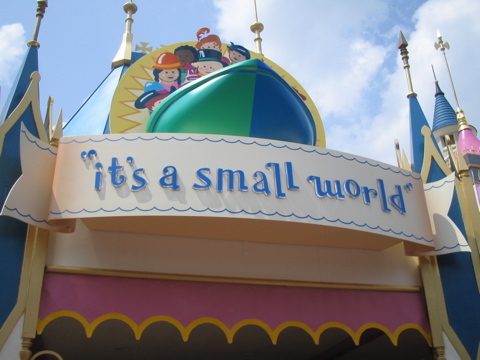 “There’s so much that we share…” I spent a week at Disney World and probably didn’t take in half of what it had to offer. I’ve been alive for 40 years and probably experienced even less than that of what life has to offer. It’s a big, big world. Don’t let it pass you by.